Enhance two walls with majestic sculpture using these Whitehall Wall Eagles. 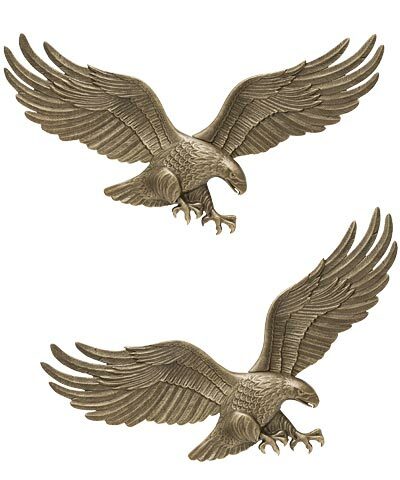 This set of 2 eagle figures lends a striking look to indoor or outdoor walls easily, and their antique brass color offers a classic finish. Outstretched wings and talons on each piece lend a hint of movement to your yard, showcasing the drama of the hunt. An intent gaze and lowered tail on each bird further this theme, and detailing throughout the units will surely capture attention. The brass hue provides a classic, aged look to the sculptures, and their aluminum construction ensures longevity. The flat back of the birds attaches to a wall easily, and their durable construction remains lovely when placed either indoors or outside. Showcase the beauty of nature in your home or garden with these Wall Eagles. Assembly required. Made in the USA. Note: This case pack includes 2 of the Whitehall Wall Eagles, Antique Brass, 29" Wide.